You own and operate your own business. You’re the CEO, and you wear a lot of hats. This lends you a handful of benefits: you have control over everything, you make all the final decisions, you are the captain of the ship. What many founders and CEOs of small- to medium-sized companies do not understand, however, is that their ability to control everything allows employees, whether outsourced or in-house, to keep secrets from you. 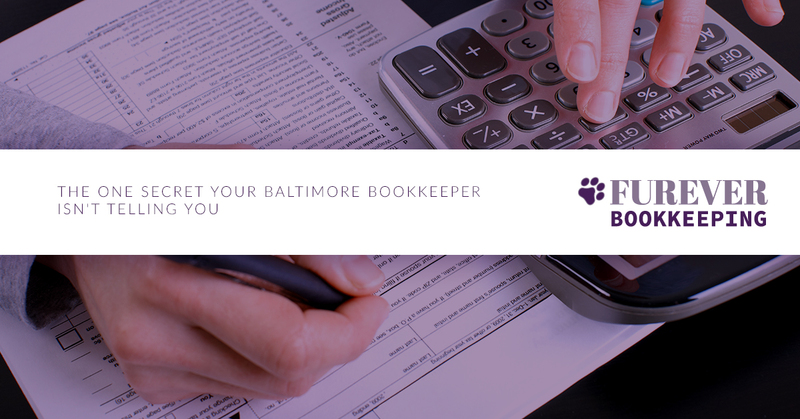 What’s the one secret that your Baltimore Bookkeeper is keeping from you? Businesses with less than 100 employees are losing more than $155,000 annually to bookkeeping fraud, according to an Association of Certified Fraud Examiner’s (ACFE) Survey. What does this mean for your business. As counterintuitive as it may sound, you need to delegate. Foster relationships with those you can trust. Know where your business stands instead of getting lost inside of it. Your control in the business is blinding you from running the business toward success. It’s a challenge to find a reliable, trustworthy bookkeeper, as well as Baltimore Quickbooks services. However, once you find the right local Bookkeeper in Maryland that can support your business not take advantage of it, you will find that your financial reports, accounts receivable, accounts payable, payroll, and invoicing are accurate and correct. What’s more, master bookkeeping services will give you more time to work on your business instead of in it. You can spend hours filtering through local bookkeeper searches online with “bookkeeper near me,” or you can call a forensic bookkeeper in Baltimore that provides comprehensive bookkeeping services, as well as being certified in all version of Quickbooks. Here’s why you need to call me, now! When you call me, nothing will fall through the cracks. I will catch everything, deliverin you accurate and consistent reports as you need them to make financial decisions within your business. Each and every line item matters, and I will account for it. I am your master bookkeeper with more than 15 years of experience in all industries. Lucrative financial decisions are made based on industry knowledge. I have experience with books ranging between $200,000 and above $32 million. You know your business better than anyone else in the company. I aim to know it just as well as you do. In fact, I prioritize knowing your business well enough to help with financial decisions, as you see fit. Certified in all versions of Quickbooks, I leverage a versatile knowledge in many different accounting softwares to help your business grow. Are your books a mess? Do you want to toss your financials out the window? I bring books current, provide accurate reports, and give you the freedom to work on your business instead of in it. I resolve complex bookkeeping issues. As your Top Rated Local® Master Bookkeeper, I provide expert bookkeeping services to grow your business and save you a ton. Call me, now!